The housemates woke up to the song ‘Head Ya Tail’. Priya started the day by guessing what song might mean. She guessed that it may mean that Prince and Kishwer would have to take some really tough decisions in the future. Just after it, when Priya started making Paranthas, Mandana came and taunted her for way of making them and said that she is not using the correct one to do the job. 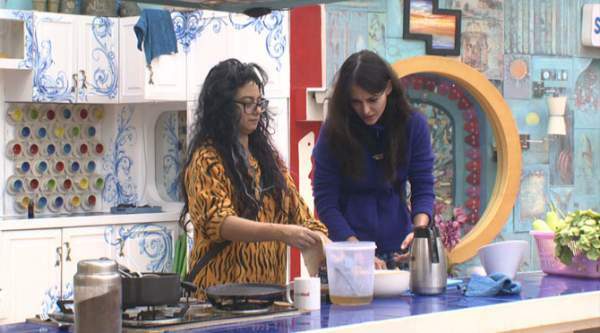 Priya defended herself by saying that Keith prefers less oil while Mandana insisted to put more. Soon after it, Mandana got another chance to blame Priya. Priya’s hair once touched the flour. To get away from the blame of wasting the flour, Priya kept that away. However, Mandana took some flour away and said to Priya that she didn’t need to make Paranthas for her. The housemates asked her to not to do so, but she didn’t move a little bit. Bigg Boss 9 Day 89 Episode 89 8th January 2016After getting tired from the fights, Rochelle finally asked Prince and Kishwer that if they really think that they can win the task by staying out in the garden area. Prince got irked and asked Roch to stop asking such stupid questions. After seeing the determination of both the contendors, bigg boss increased the get away offer amount to Rs. 9 lakh and decreased the winning amount to Rs. 41 lakhs. Rest of the housemates had a discussion over how Prince and Kishwer should respond now as the amount also matters. Bigg Boss 9 Episode 89After a while, Mandana tried to play trick. She tried to convince Kishwer that if she leaves, she will not only gets the amount but also provide a chance to Prince to reach the finale. However, Kishwer said that she don’t care about the money, but she wanted to place herself in the final five. That was not all. Mandana discussed and even tried to convince housemates as to why Kishwer should leave and not Prince. After a while, big boss made another announcement of increasing the offer amount to Rs. 13 lakh and decreasing of the winning amount to Rs. 37 lakhs. Then, she tried to talk to the BB saying that he should make an announcement to take decision in one hour. Bigg Boss 9 8th Jan. 2016Manadana got frustrated and started mopping and clearning, but that were not her duties for this week. Rishabh, after seeing, said to her that it is his duty and he will do it. But, Mandana didn’t stop and insisted on it. Then, Rishabh narrated the whole incident to housemates. The fellow contestants started to discuss as how Mandana seems to believe that she is the winner and her money is getting deducted. Later on, BB made a final offer to them by increasing the offer money to Rs. 15 lakh and the winning amount was decreased to Rs. 35 lakhs. Further, BB told Prince and Kishwer to make their decision within the next one hour else it will left on other housemates. After the announcement, the housemates left Prince and Kishwer to decide. Finally, Kishwer left the show for Rs. 15 lakh. The Bigg Boss 9 Day 89 Episode 89 8th January 2016 ended. Stay tuned for latest bb9 news. Don’t forget to share. I think bb set a unfair situation on the both prince and kishwer…………karo ya maro situation……..